Zeal Manufacturing & Calibration Services Pvt. Ltd.
We make wide range of Power Energy Meter Calibrators. They are(1) Three Phase Power Energy Meter Calibrator (2) Single Phase Power Energy Meter calibrator (3) DC Power Energy Meter Calibrator. We also make customized calibrators in this category of products. They are being used by the Energy Meter manufacturers, Calibration laboratories and the power plants ( conventional and solar/wind ). 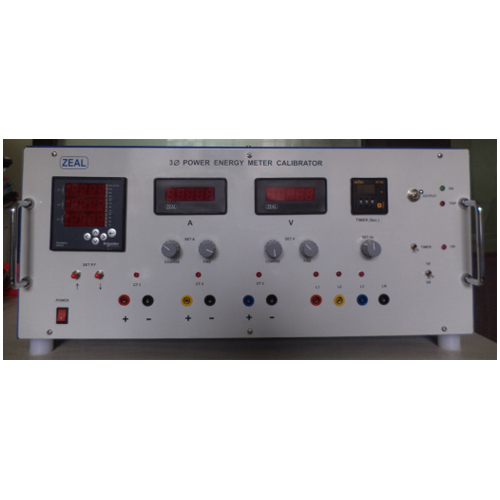 We make ‘Three Phase Power Energy Meter Calibrator’ which is a source of AC Voltage, AC Current, Power Factor, frequency, time. Thereby it is also a source of VA, VAr, W, VAhr, VArhr, and Whr. 3 Sine waves of AC voltage, 3 Sine waves of AC Current. All these 6 outputs have synchronized frequency. Phase shift of 120 degrees are maintained among 3 voltages and among 3 currents. 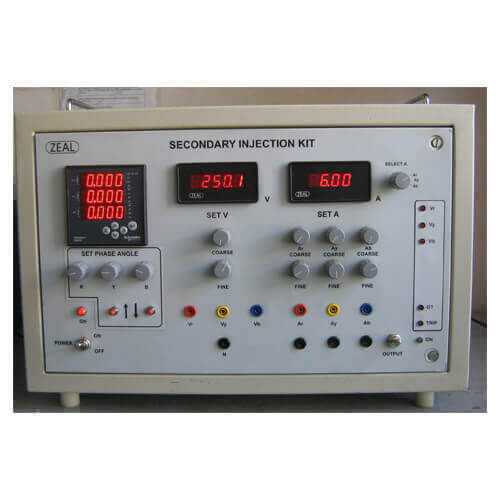 Calibrator is useful to calibrate 1Phase / 3 Phase Wattmeter, Energy meter. PF Range 0.1 Lag to Unity to 0.1 Lead. Settings Voltage, Current & Frequency by Potentiometer. Power factor by Push Button keys, Timer by thumb wheel switches. Accuracy 0.1% FS for voltage & current. 0.05%± 1 dgt for PF, 0.15%FS for wattmeter, 0.02% for time duration, Whr: 0.15%. Settings By coarse and fine set of potentiometer for Voltage and Current By push button keys. With programmable timer counter to keep output ON for fix duration. Duration programmable in minute. Metering Digital AC Voltmeter, Digital AC Ammeter, Universal meter to indicate PF, W, VA, Var of each phase. Also average of all phases, WHr Programmable current display to accommodate any CT ratio.